Is your internet service shoddy? Do you find that your connection is in and out? Do you think major data centers have the same types of problems? The answer to that last question appears to be yes. In a wonderfully titled article, “Guns, Squirrels, and Steel: The Many Ways to Kill a Data Center,” Wired provides a nice rundown of the principal culprits (allusion here). As the title indicates, squirrels can account for up to 15-20% of cable damage at some data centers. The other culprits include hunters shooting out insulators, lightning strikes, explosions, and thieves — like thieves thieves, not virtual ones. For those of you unfamiliar with the scourge of squirrels, let me just say that there are significant resources dedicated to fending off these furry little guys, and there is no one right way to do it (see, for example, the classic Outwitting Squirrels: 101 Cunning Stratagems to Reduce Dramatically the Egregious Misappropriation of Seed from Your Birdfeeder by Squirrels). 101 ways. And that’s just for bird feeders, not Amazon.com! And the Outwitting Squirrels guide probably doesn’t include this or this, though honestly I haven’t consulted it lately. 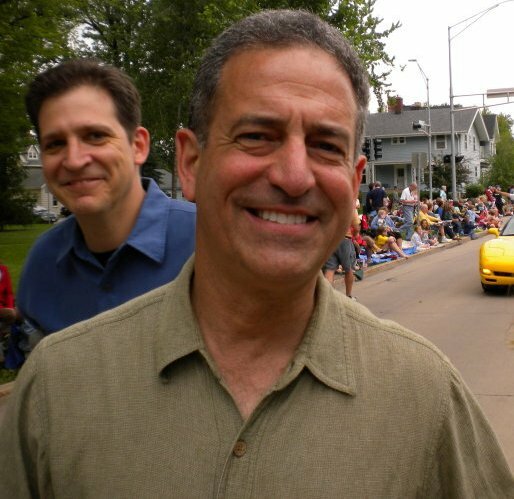 On Sunday, former Senator Russ Feingold will pick up an honorary degree and deliver our Commencement speech as our seniors prepare to march off in glory. Feingold was a notoriously independent voice, as evidenced by his lone vote against the PATRIOT Act. Illustrating the odd second dimension of American politics, this week Tea Party hero, Rand Paul, nearly derailed the reauthorization of the PATRIOT Act by fundamentally siding with Senator Feingold’s position on the encroachment of federal power. Indeed, the libertarian press shed a tear for Feingold, even comparing him to the incomparable Wisconsin icon, Robert LaFollette. There is no ring in his nose. Nobody owns him. Nobody bosses him. Nobody even advises him. Right or wrong, he has stood on his own bottom, firmly and resolutely, since the day he was first heard of in politics, battling for his ideas in good weather and bad, facing great odds gladly, going against his followers as well as with his followers, taking his own line always and sticking to it with superb courage and resolution. Suppose all Americans were like LaFollette? What a country it would be! No more depressing goose-stepping. No more gorillas in hysterical herds. No more trimming and trembling. Does it matter what his ideas are? Personally, I am against four-fifths of them, but what are the odds?…You may fancy them or you may dislike them, but you can’t get away from the fact that they are whooped by a man who, as politicians go among us, is almost miraculously frank, courageous, honest and first-rate. Indeed, I bet civil libertarians miss Senator Feingold on the floor, as he and Paul would have made for interesting bedfellow. Here’s Lynne Kiesling at Knowledge Problem on some recent trends in security versus liberty tradeoffs. If you’ve ever scratched your head and wondered where I get all of that data on regulatory budgets and staffing, scratch no more — the new A Decade of Growth in the Regulators’ Budget: An Analysis of the U.S. Budget for Fiscal Years 2010 and 2011 is here! Brought to us by former OIRA head, Susan Dudley, the brief combs the U.S. budget for all the summary statistics on agency appropriations and staffing. (For those of you who can’t see the axes here, along the X axis is years, beginning in 1960 and ticked off in five-year increments. 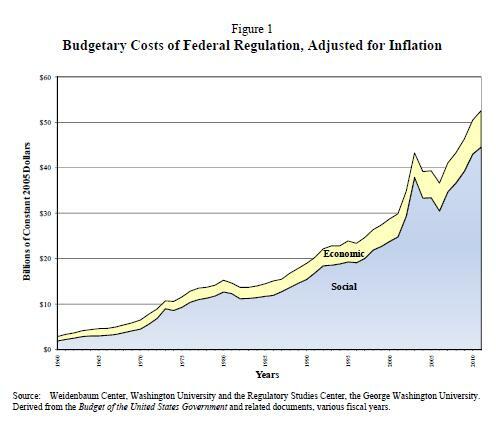 Up the Y axis is billions of 2005$ in $10 billion increments). A page turner, I know. The brief reveals that outlays and staffing are at their all-time highs, which does not surprise me. I do, however, marvel at the growth of Homeland Security. In real terms (2005$), the Homeland Security budget has gone from $8.8 billion in 2000 to more than $20 billion today, accounting for more than 40% of U.S. regulatory spending and more than half the personnel as well. Mind boggling. As I hope will become a tradition here, feel free to play the “my favorite part of the regulatory budget report” game. The winner will receive at least one sticker. Posted on May 26, 2010 June 2, 2011 Author David GerardCategories General InterestTags Defending the Homeland, econ 240, Where does the money go?